Hanoi: At least five people were killed and three missing after a deadly fire early Friday morning engulfed several manufacturing workshops and warehouses in Hanoi, state media reported. The fire engulfed small plants making recycling bins and silica gel sachets as well as storage centres for frozen goods and wooden products, according to the official Vietnam News Agency. 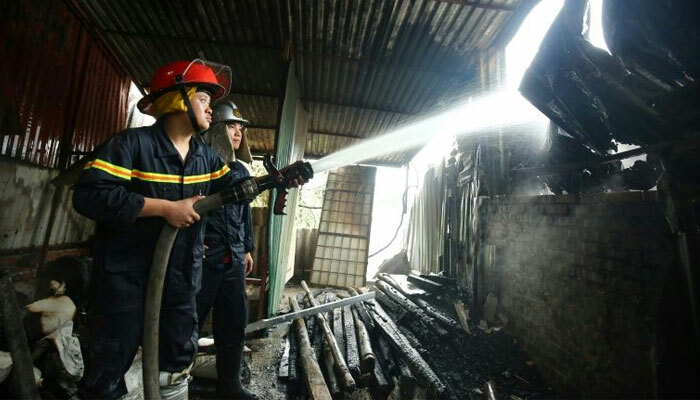 "Authorities found and took out the bodies of five victims of the fire at the workshops," VNA reported after the fire in Hanoi´s residential Nam Tu Liem district. "Authorities are rushing to find three remaining people," it added. Conflicting media reports said the toll was above five but the figures could not be immediately confirmed. The fire was extinguished by dawn and police are still investigating the cause. Images from the scene showed firefighters removing bodies from the charred site, with sheet metal roofing collapsed among the burnt debris. Witnesses said the overnight blaze quickly swallowed the workshops and warehouses, informal commercial buildings commonly seen across Hanoi. "In just 20 minutes, the fire from the plastic workshop went up really high... no one was able to approach it because the fire was too strong," witness Vu Van Can told state-run news site VnExpress. Big blazes are relatively common in Vietnam, where fire prevention and firefighting services remain underdeveloped. Thirteen people were killed in an apartment complex fire in Ho Chi Minh City last year after the high-rise was engulfed in flames overnight, trapping many inside their homes. That was Vietnam´s deadliest fire since 2016 when a blaze in a karaoke bar in Hanoi left 13 people dead, Most were government workers who died in the club´s soundproof chambers.